Alexandria Hotel v Soluň, Řecko: Zarezervujte nyní! 50% refund on the booking deposit five(5) days prior to arrival in case of cancellation. No refund on the booking deposit in case of non show or reduction in numbers. 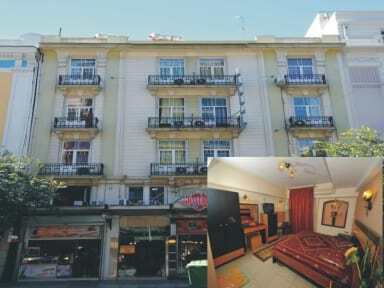 Hotel Alexandria is placed at the historical centre of Thessaloniki on Egnatia Street, the most famous road of the city. A landmark building from 1928 provides it's customers with high quality services (with low prices), as it was newly renovated at 2007, yet maintaining its traditional style. Within 10-15 minutes walk, you are able to get to: the train station, the university, the White Tower, the Galerius Arch, Aristotle's Square, Tsimiski Str, all famous byzantine churches and many other famous spots of the town. In front of our hotel pass many bus lines that they will drive you almost anywhere to our town. Our hotel has all needed comforts in 28 rooms with one, two, three, or four beds. Each one of them has WC, A/C, TV, WiFi internet connection, and a mini bar inside. There is also a parking for our customers. For many years now we run our family business passionately about the tidiness, the safety, and all these values that characterize a traditional hotel, keeping our prices low. Thus, we secure the friendliest environment for our customers. Enjoy our hospitality while visiting the town of Thessaloniki, one of the most beautiful towns in Greece. Cancellation Policy : If cancelled up to 2 days before date of arrival, no fee will be charged. In case of no-show: the first night will be charged. If cancelled or modified later( after check-in) 100% of the remaining days will be charged.